Key difference: The key difference between Tarot and Oracle cards lies in how the decks themselves are developed. Both types of decks used for personal growth, inspiration, coaching and divination. Tarot and oracle are deck of cards used for knowing the future or any happening in life. It’s not compulsory to entirely believe in these types of cards, as they rely on different concepts and methodologies. A tarot card is considered to be a divination card which has dramatic images of crumbling towers and scythe wielding skeletons. While, the oracle cards are easy to read as most of its meanings are written right on the card itself. Tarot cards are known to provide a very in-depth detail to any of the situations. These cards have a specific structure of 78 cards, with the 22 Major Arcana (The Fool through the World), and the 56 Minor Arcana cards, split into 4 suits (traditionally Pentacles [Coins], Swords, Wands, and Cups). Each of the 4 suits have cards 1 (Ace) through 10, and then their respective court cards, consisting of Pages (or Princesses), Knights (or Knaves), Queens, and Kings. The tarot, first known as trionfi and later as tarocchi, tarock, and others, is a pack of playing cards. Commonly it has 78 cards, which are used from the mid-15th century in various parts of Europe to play a group of card games such as Italian tarocchini and French tarot. These structures consists of freedom of artists; depending on the deck theme or artist’s intentions, specific cards can be renamed or can be switched; like for example: The Fool can become a Seeker. Even their elemental correspondence can be switched, for example: some decks match Swords with Fire and Wands with Air. Tarot cards are future and spiritual oriented as their results may be with the individual or against the individual. Oracle cards can range from a deck less than a dozen to a deck of hundred cards. There is no traditional pattern or suits as such for the oracle cards. Oracle cards are also known as the wisdom cards and are completely different from that of tarot cards. Each oracle deck is different from the next in structure, number of cards and what cards are present. Often oracle decks don't follow a specific pattern, they are just a list of one card after another, usually without much association between the cards that are near one another (i.e. card 10 will have nothing really to do with card 11 or 9). Each oracle desk is unique. Oracle cards are more positive-oriented, as these cards helps and individual to think positive and start with a new beginning in any depressed mood. 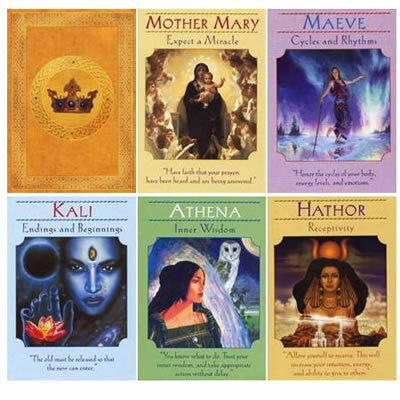 Oracle cards consist of yes-no pattern and has a straight forward answers in them. There are different types of oracle cards according to the situations and future, these cards gives results. Hence, both tarot and oracle cards are used for their specific purposes. Tarots are more dramatic and final result oriented; they are regarded to be the most divine cards. Their results may be good or bad depending upon the future situations. Oracles on the other hand, are positive result-oriented which relies on the real and good happenings in an individual’s life. They can be considered as only one sided type of cards. Hence, it depends on every individual who prefers these cards, whether to believe in them or not; as they are not that true and really helpful in real aspects. So, it’s an individual’s trust and belief on these cards and their assumptions.